Local to me | Curses! Foiled Again! 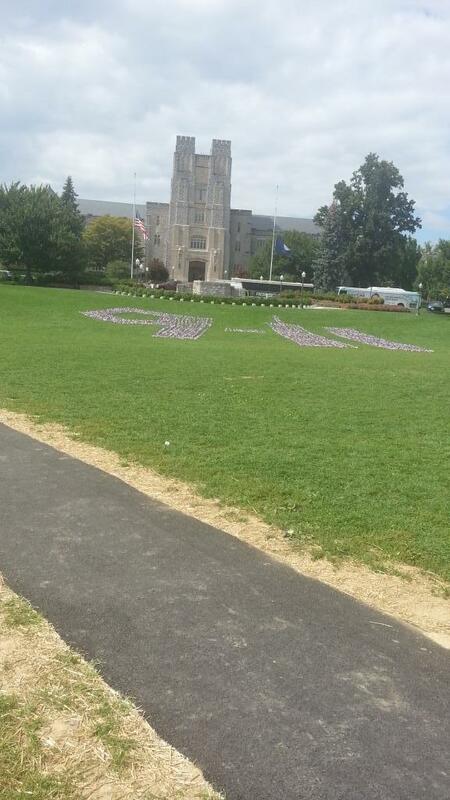 That is 2,977 American flags placed on the Virginia Tech drillfield – effectively the center of campus. One flag for each victim of the terrorist attacks of September 11, 2001. Most chilling was the murderer, whose name I no longer recall. I do remember that his fingertips were oddly flared and he pressed them together, expanding and contracting his hands like a bellows. No doubt aware that I was nervous, he seemed amused by my questions. I may not agree entirely with the author, but it’s at least a balanced and fair article, without the normal heavily anti-gun bias the Roanoke Times usually publishes. Go read the whole thing. It’s worth it. I’d like to give a belated thank you to those who gave their sympathy on the recent death of my cat Midnight. It was appreciated. As a bit of a surprise, a few days after that, I received a sympathy card from the vet. Now, I suspect there are many veterinary clinics that will send such cards, but what was really surprising was that this one had a very nice and personalized hand written note from the veterinarian that actually attended us that night. Sometimes it’s the little touches that can make such events bearable. Due to a combination of bad timing and the fact that there is only one gas station in my area that has alcohol-free gas, I had to put $5 of alcoholic gas in the car yesterday. I’ll run it close to dry before filling up again to try and minimize the impact. Before I left for the gun show, my car was reporting an average mileage of 24.8 mpg, up from the previous 24.5 mpg. After the gun show, which involved driving on the interstate, it shot up to 25.3 mpg, but that’s not really useful data here because of the difference in driving styles. A couple of weeks ago, just as the gun-control debate in the Senate was heating up, a nameless attention-whore decided to take a shotgun and shoot up the local community college satellite campus. This is MY community college, the one that I am currently taking classes at. Thankfully, he didn’t manage to kill anybody, and only managed to wound two people (which is probably the only reason the anti-Rights blood-dancers didn’t jump all over it). I call him an attention-whore because he actually posted his intent on 4chan before he started, and posted the address for the local emergency services internet radio scanner, telling people to listen to the chaos he was about to inflict. As a result, the maintainer of that scanner has discontinued it (I assume that’s the reason, based on the note at the link, which says “Due to recent events that have taken place in my community, I have decided to discontinue this feed.”). This is highly irritating to me, since I frequently used it while at work to see if there was a major emergency nearby – usually when I would hear multiple police/fire/EMS sirens. That scanner feed is how I learned about that particular incident, and how I learned about the murder of Virginia Tech Police Officer Deriek Crouse, which occurred only a couple of blocks from my office. Speaking of learning about these incidents, I also learned (or verified, really, since I already knew) that you cannot rely on those fancy text/email alert systems that most colleges have put in to warn people about emergencies. It wasn’t until about 20 minutes after the shootings that I got the first text message from the college, and that only said that the college was “closing immediately at both locations”. The first message alerting students that “administrators have unconfirmed reports of a shooting” at the mall campus didn’t go out until 40 minutes after the shootings. In other words, by the time I got the emergency messages, the emergency was long over. I don’t know whether the delay was in getting the message to the administration, the administration waiting to send it, or simply the cellular networks getting overloaded by the sudden batch sending of about 5,000 text messages, but it was essentially useless as an actual emergency alert system. Like always, you are on your own when it comes to your own safety. And, of course, the school’s policy is to disarm students and staff under penalty of expulsion/firing, and make their campuses into Gun Free Victim Disarmament Zones. It worked just as well in this case as it always does. April 16, 2007 – We Remember. Six years ago today, horror struck Virginia Tech in Blacksburg, Virginia. Most of those who were freshmen at the time will be graduating, and most of the upperclassmen are gone, but the memories remain with the faculty and staff, the town residents, and especially with the police and EMS providers who responded. The killer shot his first victims around 7:15 a.m. in West Ambler Johnston Hall. At about that time, the killer entered the room that freshman Emily J. Hilscher shared with another student. Hilscher, a 19-year-old from Woodville, Virginia, was killed. After hearing the gunshots, a male resident assistant, Ryan C. Clark, attempted to aid Hilscher. Clark, a 22-year-old-senior from Martinez, Georgia, was fatally shot. Hilscher survived for another three hours. The killer left the scene and returned to his dormitory room. While police and emergency medical services units were responding to the shootings in the dorm next door, the killer changed out of his bloodstained clothes. Police receive information leading them to consider Hilscher’s boyfriend as a suspect. Almost two hours later, he walked to the nearby downtown post office and mailed a package of writings and video recordings to NBC News; the package was postmarked 9:01 a.m. He would then go to Norris Hall. At about 9:40 a.m., just over two hours after the initial shootings at West Ambler-Johnston, the killer entered Norris Hall, which houses the Engineering Science and Mechanics program among others, and chained the three main entrance doors shut. He placed a note on at least one of the chained doors, claiming that attempts to open the door would cause a bomb to explode. Shortly before the shooting began, a faculty member found the note and took it to the building’s third floor to notify the school’s administration. At about the same time, the killer had begun shooting students and faculty on the second floor; the bomb threat was never called in. At about 9:41, within one or two minutes of the first shots, the first 9-1-1 call was received. Because it came from a cell phone, it was routed to the Blacksburg Police dispatch center instead of the Virginia Tech Police. Despite some initial confusion, it takes only about one minute for the dispatcher to recognize that the call is coming from on campus and transfer the call. The first police officers arrive within three minutes of receiving the first 9-1-1 call, but cannot enter because the doors of all three exterior entrances are chained shut. Attempts to shoot out these locks are unsuccessful. The killer’s first attack was in an advanced hydrology engineering class taught by Professor G. V. Loganathan in room 206. The killer first shot and killed the professor, then continued shooting, killing nine of the 13 students in the room and injuring two others. Next, the killer went across the hall to room 207, in which instructor Christopher James Bishop was teaching German. The killer killed Bishop and four students; six students were wounded. He then moved on to Norris 211 and 204. In both of these classrooms, the killer was initially prevented from entering the classroom by barricades erected by instructors and students. In room 204, Professor Liviu Librescu, a Holocaust survivor, forcibly prevented the killer from entering the room. Librescu was able to hold the door closed until most of his students escaped through the windows, but he died after being shot multiple times through the door. One student in his classroom was killed. Instructor Jocelyne Couture-Nowak and student Henry Lee were killed in room 211 as they attempted to barricade the door. The killer reloaded and revisited several of the classrooms. After the killer’s first visit to room 207, several students had barricaded the door and had begun tending the wounded. When the killer returned minutes later, Katelyn Carney and Derek O’Dell were injured while holding the door closed. The killer also returned to room 206. According to a student eyewitness, the movements of a wounded Waleed Shaalan distracted the killer from a nearby student after the shooter had returned to the room. Shaalan was shot a second time and died. Also in room 206, Partahi Mamora Halomoan Lumbantoruan may have protected fellow student Guillermo Colman by diving on top of him. Colman’s various accounts make it unclear whether this act was intentional or the involuntary result of being shot. Multiple gunshots killed Lumbantoruan, but Colman was protected by Lumbantoruan’s body. Students, including Zach Petkewicz, barricaded the door of room 205 with a large table after substitute professor Haiyan Cheng and a student saw the killer heading toward them. The killer shot several times through the door but failed to force his way in. No one in that classroom was wounded or killed. Hearing the commotion on the floor below, Professor Kevin Granata brought 20 students from a nearby classroom into an office, where the door could be locked, on the third floor of Norris Hall. He then went downstairs to investigate and was fatally shot by the killer. None of the students locked in Granata’s office were injured. At about 9:50, using a shotgun, police shoot open the ordinary key lock of a fourth entrance to Norris Hall that goes to a machine shop and that could not be chained. They hear gunshots as they enter the building and immediately follow the sounds to the second floor. As they reach the second floor, the killer fires his final shot, killing himself. At about 9:52 a.m., the killing is over. The killer shot himself in the head just as police reached the second floor. Investigators believe that the police shotgun blast alerted him to the arrival of the police. The killer’s shooting spree in Norris Hall lasted about 11 minutes. He killed 30 people in Norris Hall, and wounded 17 others. It is the worst mass killing by a single gunman in U.S. history. The horror continues. The police work to clear the second floor of Norris Hall. Two tactical medics attached to the Emergency Response Teams, one medic from Virginia Tech Rescue and one from Blacksburg Rescue, are allowed to enter to start their initial triage. Police are carrying out victims and handing them off to waiting Rescue Squads, still unsure if there is a second shooter waiting inside. High winds have grounded rescue helicopters, meaning that the most seriously wounded victims must instead be transported 30-45 minutes by ground to the closest Level 1 trauma center in Roanoke, Virginia. False reports of gunshots throughout the rest of the day mean a continuation of the fear and psychological trauma for students and local residents. In the hours and days following the shooting, makeshift memorials to those killed or injured began appearing in several locations on the campus. Many people placed flowers and items of remembrance at the base of the Drillfield observation podium in front of Burruss Hall. Later, members of Hokies United placed 32 pieces of Hokie Stone, each labeled with the name of a victim, in a semicircle in front of the Drillfield viewing stand. This makeshift memorial was later made permanent. Update – 1609 hrs: The Christiansburg Police chief spoke at a press conference this afternoon, and stated that there were two people injured – one flown and one taken to the local hospital – and a suspect in custody. It is believed that there is no more danger. No further information is being released at this time. Ignore the stupid reporters calling him a Montgomery County Sheriff’s deputy. That’s definitely a CPD uniform, and you can see the eagles on his collar even with the poor quality streaming video. The press, as usual, is ignorant. News reports here, here, and here. That third link is to the Roanoke Times, which seems to be having issues at the moment, probably due to high traffic. This is in Christiansburg, VA, right next to Blacksburg and Virginia Tech. Initial reports are that the shooter is in custody, and that one person was flown out. The media has no reports of other injuries at this time. The police have a press briefing scheduled for 1500hrs EDT. The Virginia Tech Police Department has obtained a full confession in the most brazen crime our area has seen so far this year! I’ve mentioned the Virginia Citizens Defense League (VCDL) before, and I’ve had their website in my links to the right for a long time, but this is a good day to mention them again. They now have their 2013 Legislation Tracking Tool online, with a full listing and synopsis of this year’s gun and gun-related bills in the Virginia legislature – including links to the state’s website for details and actual text. In addition, they’ve revamped the site a bit, which is great. They do some incredible work with the legislature, but the old website had some serious design issues. While I see that some of those issues have carried over to the new design, it’s still light years better than it used to be. I’m going to back off on posting my Legislative Updates now that they have the tracking tool up and running for this year’s session. I will still post on major bills and events as I see the need, but VCDL has people dedicated to that who are able to do a much better and more consistent job than I can. I’ve put the bills that are more relevant to the average citizen in bold type, and critical bills are in red. Contact your Virginia state representatives!